Severe weather likely to hit plains today | Watts Up With That? WHAT: NOAA National Weather Service will hold a media call Sunday, November 17, at 12:00 noon ET to discuss the latest forecast from the NOAA/NWS Storm Prediction Center for high winds and possible tornadoes affecting Illinois, Indiana, northern and western Kentucky, lower Michigan, Ohio and southeast Wisconsin. Officials will discuss the forecast for development of a few strong, long-track tornadoes over parts of the Mid-Mississippi and Ohio Valleys into Michigan today through early tonight. You can bet that if there are tornadoes produced from this we’ll see claims along the lines that “tornadoes in November are unusual” (They aren’t, see graph below) and that this is another “signature of global warming” (the science shows it isn’t, see IPCC SREX report). THE LONG ANTICIPATED SEVERE WEATHER THREAT DAY HAS ARRIVED. TWO LOW PRESSURE SYSTEMS IN THE UPPER MIDWEST ARE BEGINNING TO MERGE AND INTENSIFY THIS MORNING. DID NUDGE UP HIGH TEMPERATURES A COUPLE OF DEGREES ACROSS NW OHIO AND PARTS OF NORTH CENTRAL OHIO WHERE THERE WILL NOT BE AS MANY SHOWERS. RECORD HIGH IN TOLEDO IS 71 AND WE WILL TAKE A RUN AT IT. 72 AT CLE IS POTENTIALLY WITHIN REACH. SORT OF LOOKS LIKE OKLAHOMA IN THE SPRING TIME…HMMM. Not sure why you called Missouri, Illinois and Wisconsin the “plains”. I always thought of Illinois and Wisconsin as the Midwest. Global changie-ness I tells ya! Tornado watch now issued for Michigan. SPC calls it a “particularly dangerous situation with several intense tornadoes LIKELY” I have been a meteorologist for 45 years and have never seen the threat this high this far north so late in the season. Dr Masters over at weatherunderground says this is very unusual to have such sever weather at this time of year. One of the best things about “Weather Underground” is their interactive maps. SPC has only issued two high risk areas during November in the last 15 years. On November 15, 2005 there were 49 tornadoes including a confirmed EF4. On November 10, there were 64 tornadoes with 34 fatalities. It’s called weather. Weather is variable. Just like they’ve never had this short a period between snowfall in South Dakota. It’s weather. Here’s hoping that the people up there heed the warnings and pay attention to local weather resources which update storm tracks, etc. On the brighter side, the worst part of the storm is expected to dissipate before nightfall, which means it won’t catch most people sleeping. While those areas may not be part of “The Great Plains”, they and parts of Indiana and Ohio are just plain flat. Beyond the tornado risk, it seems to me this storm fits the description of the “Witch of November”. Many of these storms combine three elements. First, a Pacific storm moves into the northwest and continues just south of the Canadian border. Between mid-autumn and mid-winter, small systems can feed warm moist air from the Gulf of Mexico north and cold Canadian air south. When the Pacific storm moves into this environment, it can wrap both air masses together and “bomb out” into a major storm. The immense volume of water in the five Great Lakes holds heat. This allows the lakes to remain relatively warm for much later into the year and postpones the Arctic spread in the region. During the autumn months, two major weather tracks converge over the area. Cold, dry air moves south/southeast from the province of Alberta and northern Canada; warm, moist air moves north/northeast from the Gulf of Mexico, along the lee of the central Rocky Mountains. The collision of these masses forms large storm systems in the middle of the North American continent, including the Great Lakes. When the cold air from these storms moves over the lakes, it is warmed by the waters below and picks up a spin. As the cyclonic system continues over the lakes, its power is intensified by the jet stream above and the warm waters below. The result is commonly referred to as a “November gale” or “November witch”. Such a storm can maintain hurricane-force wind gusts, produce waves over 50 feet (15 m) high, and dump several inches of rain or feet of snow. Fuelled by the warm lake water, these powerful storms may remain over the Great Lakes for days. Intense winds then ravage the lakes and surrounding shores, severely eroding the shoreline and flooding the shorelines. The Middle West states are OH, MI, IN, IL, WI, MN, IA, MO, KS, NE, SD & ND. The Great Plains are the western part of the Midwest. They also extend into four Western & two Southern states. Midwestern states east of the Mississippi can be considered part of the Great Plains if you include the native tallgrass prairie portions of IL & bits of WI, IN & MI with the midgrass & shortgrass prairies or plains. Flatness isn’t even required. Rolling hills, lakes & river valleys will do. Not to mention the Badlands or outliers of the Rockies like the Black Hills. No doubt you will have ill-informed people on your TV screens telling you that these storms are as a result of AGW. That is what we had this morning, when the BBC were telling us that the typhoon that hit the Phillipines was caused by AGW as is the snow and Arctic winds due to arrive here tomorrow! More from the severe weather is climate change that is all of the rich countries’ fault- the latest NYT article that lays culpability for Typhoon Haiyen on the developed world. I can just about guarantee you that on any given day, at any given hour, “unusual weather” is taking place somewhere on planet earth..
pokerguy, there’s nothing unusual about this. It’s happened before, ergo it’s normal. video from Soilder Field fans taking cover under stands. Yes, and it’s your fault. Yet it has happened before…at least several times…in our short recorded history. . The minimum and maximum tornado count curve on this plot have active Novembers. These tornadoes are getting seriously out of hand. The Wreck of the Edmund Fitzgerald. By Canadian Gordon Lightfoot. Oh, right, that was pre-1975. Not CO2 related. Irrelevant to today’s topic. It’s 2:30 Central, things here in Kane county IL are now calm, at peak high winds, some BIG thunder followed by lots of thunder storms and rain, (moderate). Some standing water in ditches. “The Wreck of the Edmund Fitzgerald. By Canadian Gordon Lightfoot. Right Doug, the storms of yesteryear were different, more innocent, less dirty, less sponsored by big oil companies. They killed as many people, but God was to blame. Now it’s all our fault. How I pine for the good old days. Meanwhile the Philippines are demanding we reimburse them for causing the recent typhoon. Makes me want to take my recent donation back, to be honest. Power went out in Aurora for 90 minutes. You describe yourself as what one would take to be an “old, cool” hand. Then you talk about threat. You do not talk about fact. The cognitive dissonance is huge. How pithy. So full of fact and analysis. Clearly you know the facts. I can see why your line of reasoning is so convincing. But seriously, is this a direct quote from the NYT, the BBC, or did you cull this gem from that mushy clump of bong-resin between your ears, bro? They’re not even trying anymore. How are they even in the game?!?!? Great post, as Gordon Lightfoot preserves our history in song so that many can remember that when the past (weather) repeats itself, it is normal. How soon we otherwise conveniently forget! Again – great post! Heavy rains and hail here in Rockford. Lots of lightning action. Well that explains why the light bulbs here in Rockford were getting bright and dim at various times. Significant winds tonight and Monday morning. Strong westerly winds associated with an intense low pressure system from Colorado will develop tonight into Monday morning. Winds of 60 gusting to 90 km/h or above are expected. A low pressure system from Colorado is forecast to intensify as it crosses Lake Superior tonight. This system is expected to bring significant snowfall to parts of Northwestern Ontario and significant rainfall and strong winds to parts of Northeastern Ontario. The weather system will move into Northwestern Quebec on Monday. Near 50 mm of rain in many areas by tonight. Rain at times heavy in advance of an approaching low pressure system will continue to soak the regions from Lake Superior east to the Manitoulin Island area today. Total rainfall amounts of 50 mm are expected in many areas. Embedded thunderstorms are possible and could give locally higher amounts. Heavy rain is expected to taper off to a few showers or flurries tonight as the low tracks into Northwestern Quebec. I have been searching for damage reports. Found one dead in Washington IL. Bears game had a storm break. Lots of tornadoes sighted. Maybe droves of tornadoes sighted. In sum, what is the point of checking in with the national media? All you get is hysteria and panic. Severe thunderstorms are possible late this afternoon and early this evening. These thunderstorms are likely to form in Michigan and move northeastwards in advance of a developing low. Although winds in excess of 100 km/h are the primary threat, there also is a risk for tornadoes and large hail. In my experience, nothing unusual for an Ontario November. Seems to me, and to any other forecaster I know, that SPC was forecasting “likely” intense tornadoes all the way up into Michigan. I have never seen that before in November. That my friend is a fact. In addition, I’d say SPC over reacted. There were no confirmed touchdowns in Michigan, however we did have wind gusts to 78 mph with lots of tree damage. Moon will be maximum North declination @ culmination on the 19th, Tidal bulge production peaked when the solar and lunar declination was the same, now it is just sliding N East. The Edmund Fitzgerald storm was a lunar tidal effect the same as this storm outbreak. For the winter outlook there will be a Synod conjunction of Earth with Jupiter on December, 5th 2014, three days later Mars will be Synod with Jupiter on the 8th, then by the 11th Earth will line up with Mars. I would expect to see severe weather occurring starting from a week prior to the above listed activity, and last about a week past till the moon is max North on the 17th+ 3 days to the end. Last year much hay was made in Australia over the short heat wave that popped up as we had the solo Jupiter conjunction, this year with the additional interaction with Mars in the mix acting as a magnetic lens focusing the total magnetic flux to neck down through its small magnetosphere, short intense peaks on their long term heat wave, will be given front page headlines as if there was an CAGW effect to brag about, be ready for the lame PR. I think I should just stay out [of] this, but what is the fun in that ? 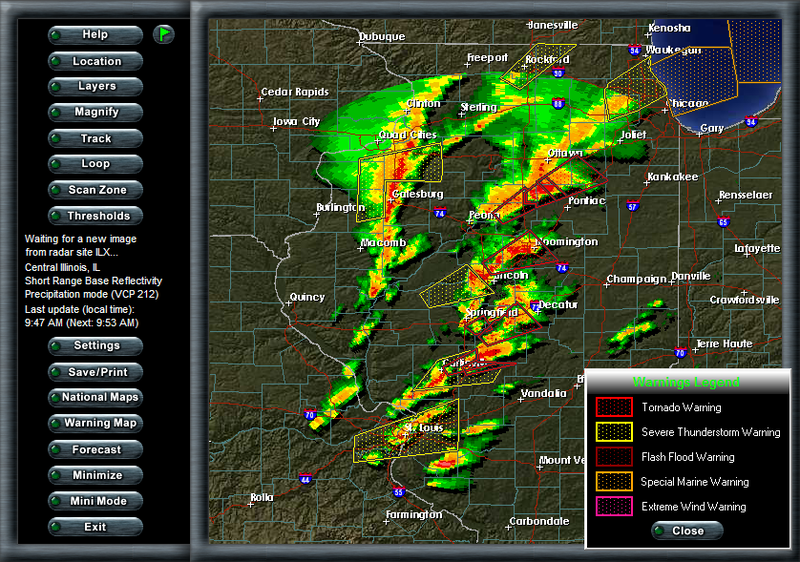 I had my 2 different radars running, watching the storms come into my Chicago suburb. It was getting kind of exciting there for awhile. Tornado watches, radar indicated tornadoes, tornadoes reported on the ground. It seemed weird, at the same time exciting for the middle of November. It is a fact about a forecast. That does not count as a fact about the weather. I really wanted to discuss weather but I have no interest in the sociology of forecasters. I am concerned about the problem of crying wolf. With the warnings that the national media put up today, one reasonably expected several small towns to be demolished with serious injuries in the hundreds. Given what actually happened, the MSM is once again training the public to ignore weather alarms. If weather forecasts are to be useful they absolutely must be reasonably accurate. This one was was not even in the ballpark. The weather forecasters in question should be very contrite at this time. 1. Strong/violent tornadoes are more frequent during global cooling, when the meridional temperature gradient is greater from the higher latitudes being colder. I know this graph has appeared here numerous times but here it is again. 2. We were in a tornado “drought” in 2013. Even with this event, which could boost the total by close to 100, the number of tornadoes this year has been very low. Linking these particular tornadoes on this one day to climate change in a year like this(extremely quiet) would be like a baseball player(MLB) batting .185 for the season in mid September, then getting going 12 for 16, with 4 home runs in 4 games and getting votes for Most Valuable Player of the year based on his hot streak. The metric to measure and judge a baseball players performance over a season is 162 games. 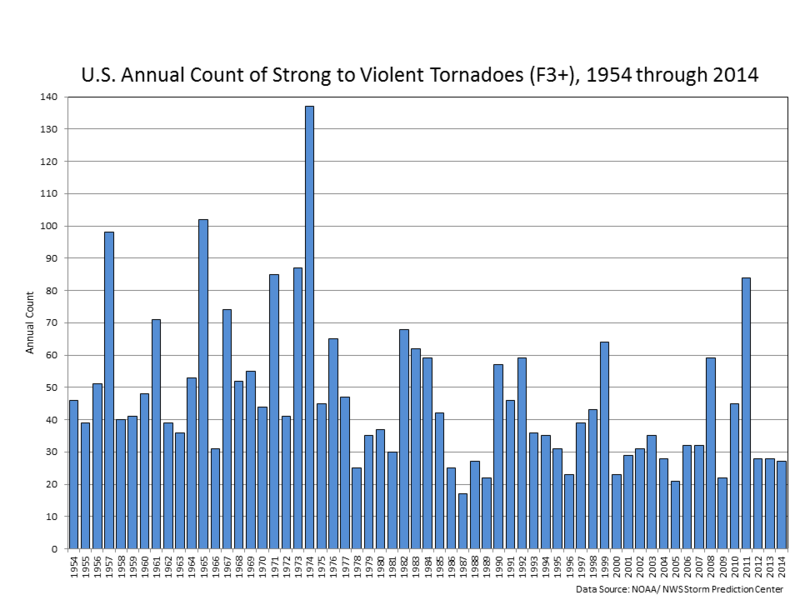 2013’s tornado season should be judged in its entirety based on the entire year which is 365 days. Regardless of mother nature having a few tornado “hot streaks” this year(like every other year), unless we have numerous widespread outbreaks in the next 6 weeks(very unlikely), 2013 will end up with an unusually low tornado count. Tornadoes in November are much less likely than tornadoes in April. So too, lousy MLB players batting .185 are much less likely to go 12 for 16 but it happens………….and they are still considered lousy after the hot streak ends and with a season ending average of .200. To Theo Goodwin…. I have no idea what you mean by the “sociology of forecasters” My comment was that I had never seen the forecast issued by SPC for “likely intense tornadoes” issued so far north in November. That is a simple fact based upon my 45 years of forecasting Michigan weather. You seem to have a reading comprehension problem. SPC did not verify their forecast for this area..there were no tornadoes in Michigan from this event, however I fully understand why they issued that forecast. All of the parameters we consider when forecasting tornadoes indicated there would be tornadoes this far north. And they were consistently saying this from three days out. It turns out as of 7PM central time there were 77 tornadoes reported, all south of Michigan. Just goes to show we don’t know everything we need to know about tornado development, however given the situation, any forecaster not calling for tornadoes in Michigan would have, in my opinion, been negligent. This has nothing to do with sociology. You have obviously never had to decide whether to pull the trigger on a severe weather forecast or not. Until you have that experience, perhaps you should withhold judgement. 77 reported tornadoes in the moderate and high risk areas is certainly in the ballpark. If you had no severe weather at your house, consider yourself lucky. Severe thunderstorms and tornadoes NEVER affect everyone. [It] ain’t everyday you get an [of] where it was really needed. Power is flickering in Chicago, due to the winds. I read the report. Damage and injuries were nothing like the Oklahoma storms earlier this year. Yet the forecast indicated something like the Oklahoma situation. The forecast was not in the ballpark. Seeing these tornadoes reminds me of a November 1988 tornado outbreak in North Carolina, where I live. Although I was 8 years old, I well remember that month. It was a very warm November. Weather Underground does have the temperature records for that month and it was a warm November. I went to bed on November 27 and then the severe weather hit. The thing about North Carolina is, for some reason, severe weather and tornadoes love the night. That night the air just felt wrong. I remember how wrong it felt. Another thing about North Carolina is the air just feels wrong when there is a tornado outbreak. It is warm and there is a constant rushing stiff breeze. And the weather was bad that night. So bad that our family Chihuahua became afraid of thunderstorms the rest of her life. Instead of watching cartoons that next day before school, I watched the weather. A F4 tornado came through not 15 miles from where we lived. Some people I knew lost their homes but thankfully did not die. This F4 tornado was on the ground for 84 miles starting in Raleigh. It was this tornado outbreak that gave me a love for weather. Tornadoes are rare in North Carolina, especially F3 and stronger. Ever since that night, our family has always said that March, April, and November are the worst tornado months. Be safe. Take the warnings seriously. November is not over yet. 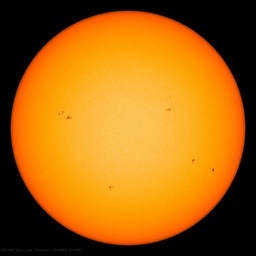 Don’t care about what may or may not be unusual or unprecedented weather-wise. It delayed the Bears vs Ravens game which caused me to have to change seats in the pub to see a TV with the Seahawks vs Vikings game later. That tightened my jaws. I give that two “Harumphs”. Weather delays for football. Unbelievable. They’ve forgotten how to play a running game. Gonna become a real curmudgeon come the ice age when there is two feet of snow on the field and wide receivers don’t know how to use snow shoes. I was also watching the storms on radar, right up to the point when the storm knocked the power off !! Spoke to my son who is a deputy in Allegan County, MI. 10+ foot waves on Lake Michigan, 40-50 mph winds, fair amount of damage. He said that waves on Lake Superior were reported to be worse. The news reports from IL looked pretty bad, but I really haven’t followed the extent of damage. I lived in SW Michigan from 1980 to 2001. We had some big fall winds and storms. I’ve been through a few East Coast Hurricanes and a couple New Orleans Hurricanes. I think the really bad storm is the one that hits and affects you, sometimes. I can’t recommend it enough. By extending our stay, we missed the storms by about four hours. Our thoughts and prayers to the folks in Washington, Peoria, Pekin, Coal City, and other impacted towns and areas in Illinois, and everyone who got in the way of this thing. oMG the CBC (Canada) is reporting that carbon is responsible for More and more Intense weather events again, both the PhillipInes AND the tornados in the USA today. The are saying its factual. The also falsely reported that the winds were the highest EVER again. @ Rob – I used to listen to the CBC everyday but their reporting is so BAD, so wrong, and editorially biased I have completely switched them off. On the topic of plains, I have ridden from Missouri to California … and Missouri to eastern Wyoming is definitely plains from the back of a horse. As for the CBC, I spent 3 hours shovelling and moving Global Warming white flaked fallout off my farm with a tractor today … and feeding livestock knee-deep in it. Saskatchewan plays Hamilton for the Grey Cup next week. Wonder if CBC will get that right? Sorry, but once I thought it, I had to say it. I humbly await the disapprobation of Greg Laden and Rob Honeycutt for making a joke about a killer storm. I can’t comment on weather forecasting for other regions, but the forecasting for central Indiana was pretty much spot on. We had very high winds (gusts up to 70mph), heavy rain and hail in my little suburb and our power was out for over an hour. We were the lucky ones – north and south of us there are towns that suffered sustained winds over 80mph and strikes by several tornadoes. The city of Kokomo seems to have taken the worst damage. Many homes and businesses have been destroyed and there are thousands still without power today. Fortunately the number of fatalities is relatively small for such a large event – and I credit that to the forecasters who put out warnings far in advance of the storm. I don’t see anyone “crying wolf” here. Don’t get me wrong. I am very skeptical of the theory of AGW, and like others I’m sure this storm will somehow be blamed on climate change (without a shred of proof). This is also nothing we haven’t seen before in November. Having said that, I think the meteorologists who got the warning out deserve credit for saving lives. Instead some of the responses here paint them with the same brush as “climate scientists” like Dr. Masters and IMHO that is a mistake. Just a note for news photographers. Guys/gals, when you take a photo at a disaster scene, do not show destruction only. Such photos contain no information. If you want to provide information about the disaster scene then show at least one border of the disaster scene. Border shots contain information. Viewers can compare the destruction to what survived. And one question. A photo of a child’s doll resting on broken limbs is supposed to convey what information? Here’s the history of this thing as it happened. Amazing that there weren’t more deaths & injuries. WAS LOCATED NEAR WASHINGTON…AND MOVING NORTHEAST AT 65 MPH. AND VEHICLES IS LIKELY AND COMPLETE DESTRUCTION POSSIBLE. TREES TO BE UPROOTED OR SNAPPED.